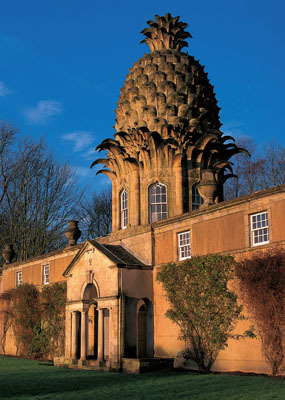 Queen of all the UK follies is The Pineapple, in Dunmore, Scotland. You can now rent her as a holiday cottage (although the interior doesn't really live up to expectations, or do the facade justice). I'm a big fan of follies, especially converted into houses, and lament the lack imagination (as demonstrated by follies) in modern architecture. I'll be dotting a catalogue of the more intriguing ones throughout the blog.